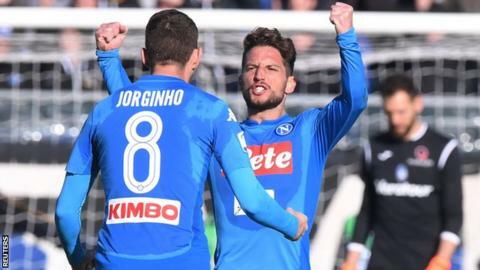 Dries Mertens' second-half goal earned Napoli a victory at Atalanta that extends their lead at the top of Serie A to four points - at least for a day. Second-placed Juventus host 15th-placed Genoa in a 19:45 GMT kick-off on Monday, when the champions can narrow the gap to one point with a win. Belgium forward Mertens had not scored in his past nine league games before finishing from Jose Callejon's pass. In injury time, Marek Hamsik had a second ruled out after a video replay. The Slovakia midfielder drove in a low shot from Jorginho's disguised pass in the 92nd minute, but replays suggested he was marginally ahead of the last defender. Elsewhere, third-placed Lazio scored five for a second match in a row as they hammered Chievo 5-1, despite losing the league's top scorer Ciro Immobile to injury. Immobile, who has scored 20 league goals this season, limped off with a thigh injury in the 35th minute, with his side 2-1 up. Sixth-placed Sampdoria's 34-year-old forward Fabio Quagliarella moved on to 15 goals for the season with a hat-trick in his side's 3-1 win over Fiorentina, while AC Milan came from behind to win 2-1 at Cagliari and move up to seventh. Match ends, Atalanta 0, Napoli 1. Second Half ends, Atalanta 0, Napoli 1. Hand ball by Mattia Caldara (Atalanta). Offside, Napoli. Jorginho tries a through ball, but Marek Hamsik is caught offside. Substitution, Napoli. Christian Maggio replaces José Callejón. Attempt saved. Marko Rog (Napoli) right footed shot from the centre of the box is saved in the centre of the goal. Assisted by José Reina. Attempt saved. Bryan Cristante (Atalanta) right footed shot from outside the box is saved in the top centre of the goal. Assisted by Nicolas Haas. José Callejón (Napoli) is shown the yellow card. Foul by Riccardo Orsolini (Atalanta). Substitution, Napoli. Marko Rog replaces Piotr Zielinski. Attempt missed. Marek Hamsik (Napoli) left footed shot from the centre of the box is too high. Assisted by Dries Mertens. Attempt blocked. Nicolas Haas (Atalanta) right footed shot from outside the box is blocked. Attempt missed. Dries Mertens (Napoli) right footed shot from outside the box is close, but misses to the left. Dries Mertens (Napoli) wins a free kick in the defensive half. Foul by Mattia Caldara (Atalanta). Offside, Atalanta. Andrea Masiello tries a through ball, but Alejandro Gomez is caught offside. Andreas Cornelius (Atalanta) wins a free kick in the attacking half. Substitution, Atalanta. Riccardo Orsolini replaces Rafael Toloi. Corner, Napoli. Conceded by Rafael Toloi. Corner, Napoli. Conceded by Remo Freuler. Corner, Napoli. Conceded by Mattia Caldara. Substitution, Atalanta. Nicolas Haas replaces Josip Ilicic. Substitution, Napoli. Marek Hamsik replaces Lorenzo Insigne. Mattia Caldara (Atalanta) wins a free kick in the attacking half. Attempt saved. Rafael Toloi (Atalanta) header from the centre of the box is saved in the top centre of the goal. Assisted by Josip Ilicic with a cross. Corner, Atalanta. Conceded by José Reina. Attempt saved. Bryan Cristante (Atalanta) left footed shot from outside the box is saved in the top left corner. Assisted by Rafael Toloi.